The market continued to improve in the early part of the week, led by the drama coming from Italy and a sharp drop in oil prices. 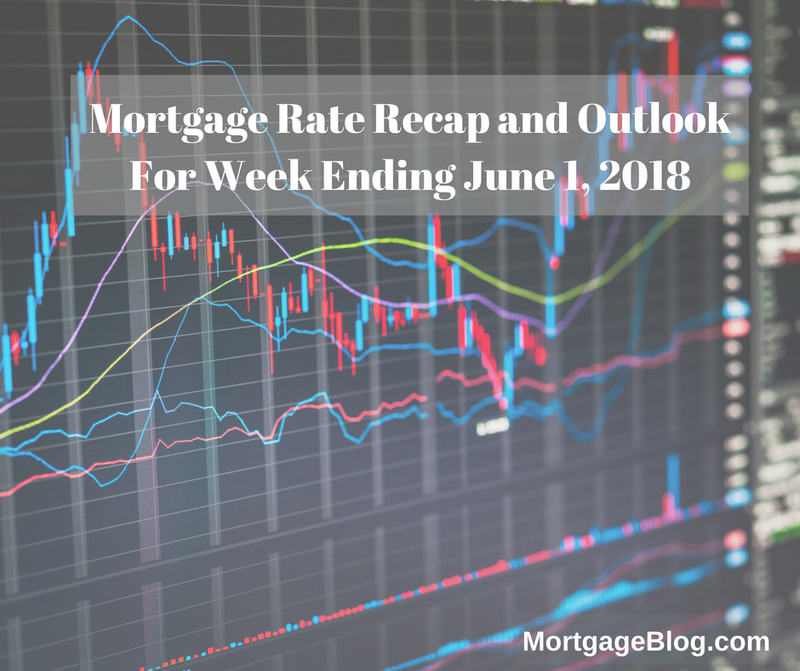 These issues are no longer impacting the markets, and mid-week Mortgage Backed Securities began to move back into the red, creating a slight pressure of increasing rates to come. Year over year PCE, the key inflation indicator, came in at 1.8% – below the Feds target of 2% – and other economic data was also relatively mild. The release of the Feds Beige Book yesterday (not a market mover) provided interesting insight across the country. Notable is the lessening of concerns on Tariff issues, and the impact of tight labor markets in some states. Employers have increased wages and non-wage benefits in an attempt to attract skilled workers. The pending news from the President, regarding metal tariffs for the EU, Canada, and Mexico, may negatively impact the markets. Tariffs cause prices to increase, which brings inflation and the bond markets hate inflation. Conversely, tariffs slow growth – which is anti-inflationary, and a positive for the bond market. The counterbalancing of these two opposing pressures will be interesting to watch in the coming weeks if the US imposes the metal tariffs effectively immediately. This candlestick chart below covers this weeks’ Mortgage Backed Securities (MBS) activity and the impact on interest rates. The green trend continued from last week into the middle of this week, which translated to slightly lower rates. 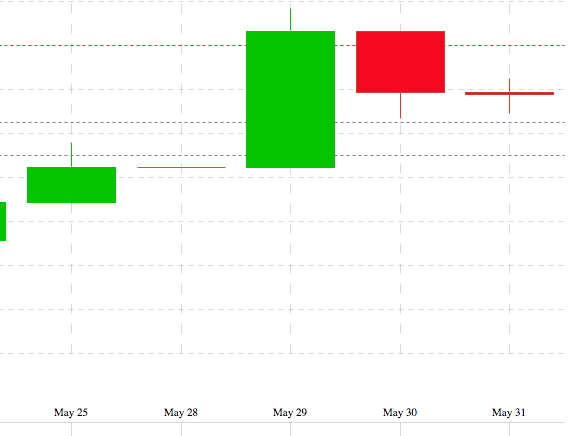 However, at mid-week, the market changed as seen in the red candlesticks. MBS directly impact mortgage rates, and the days with red indicate higher and green lower rates. This week’s Mortgage Banking Associations’ (MBA) weekly rate survey shows effective rates decreased for all but the 5/1 ARM, for loans with an 80% loan-to-value. 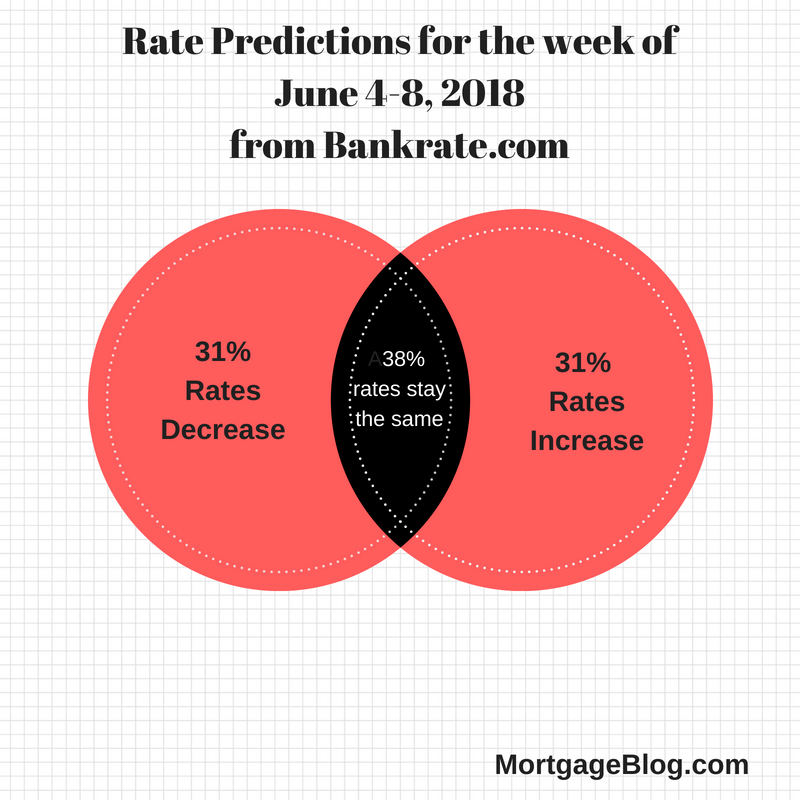 Bankrate’s weekly survey of mortgage and economic experts, countrywide, shows a split of 31% predicting interest rates will increase this coming week (plus or minus two basis points), and 31% see them falling next week. The remainder (38%) predict that rates will remain unchanged. 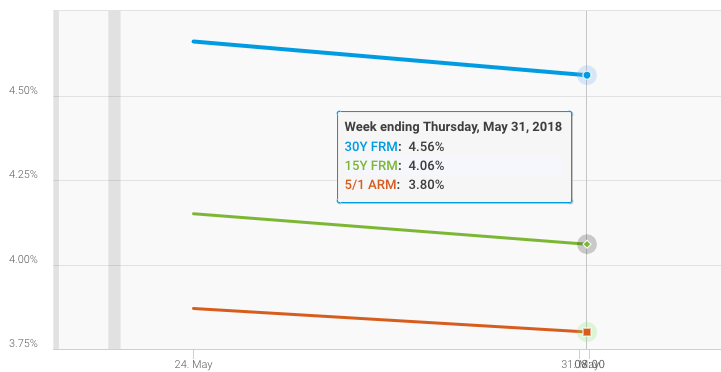 The chart below, from Freddie Mac’s weekly mortgage survey, shows conforming rates decreasing over the last week, May 25th to May 31st, for 30Y fixed, 15Y fixed and the 5/1 ARM. Recommend locking in a rate now if you are purchasing or refinancing. There is little chance of a significant breakout in the bond market that would lead to any rate improvement worth risking a more probable rate increase.